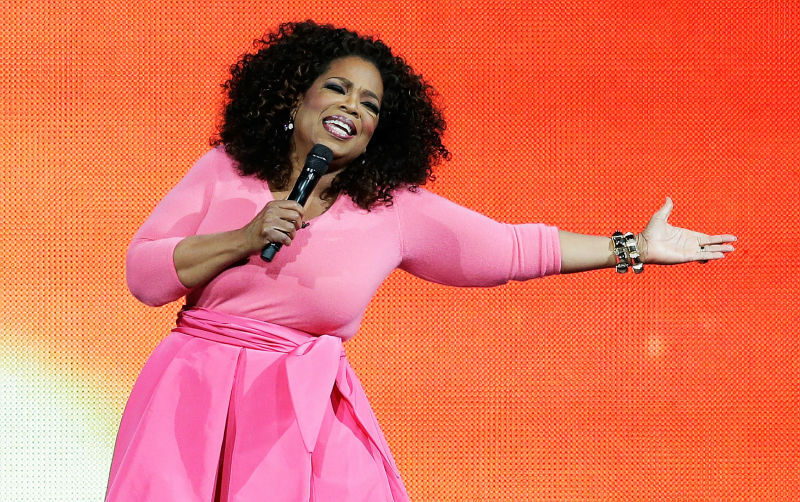 Love this provocative article titled: “What’s Up With Oprah and Homophobic Preachers?” by Michael Harriot of the Root.com, which discusses with humor, the issue of “homophobic preachers” being aired on Oprah’s OWN channel. Of course, I like Oprah, as do most of us, have been a fan since her 1986 TV premier. Weekly, I look forward to my favorite OWN shows. And dearly love the positive work that Oprah is doing toward world peace and happiness, which is poised to help a lot of people and likely does. What I don’t like is the subject of above mentioned article about “Homophobic Preachers”. Who, to me, gives religion a bad name along with Narrow-minded Fundamentalists (that makes you want to scream at your TV), Child Molesting Priests, Islamic Extremists, and other woefully misguided folks that misuse religion to validate their own confused beliefs. That said, the larger question is, should we ban all misguided speakers from our public forums? Though some thoughts are so toxic that such must surely be guarded against; still, the larger answer has to be an emphatic “No”! That is, if we want our society to remain free and open to progressive thoughts that would not be aired if left to our own flawed thinking, however right we think we are. Thanks to our free press and social media, we can continue to discuss religion openly. Of course, we can also turn off our televisions or choose another channel. The choice is ours. Note: Oprah’s Talk Show ran for 25 seasons from September 8, 1986 to May 25, 2011. Olympian Debi Thomas Seeks TV Host Iyanla Vanzant’s Help, Finds Rebuke & Scorn Instead of Compassion! “All unhealed healers follow the ego’s plan for forgiveness in one form or another. If they are theologians they are likely to condemn themselves, teach condemnation and advocate a fearful solution,” A Course in Miracles, Text 9:5. At a time when the World seems peacefully united, I just love the Olympics. 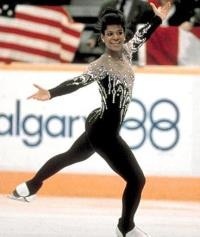 In 1988, Calgary Canada, master figure-skater Debi Thomas became “the first Black athlete to win any medal at the Winter Olympics”. Debi instantly becomes a national treasure. And, much like Muhammad Ali and the other great African American Olympians before and after her, Debi Thomas remains a credit to our race in particular. Blessed with stellar support, her mother reportedly drove over 100 miles a day taking Debi to school and training on the ice. Today, Debi Thomas is still: “The 1986 World Champion, two-time U.S. National Champion and 1988 Olympic Bronze Medalist.” Wikipedia. I remember watching Debi’s Olympic performances on television while cheering her on. I was both proud and ecstatic as she received her medal…a mere token of her advanced talent. Thank you Debi for making us all so very proud, truly a time to remember and cherish! After retiring from amateur skating, Debi graduates from Stanford University in 1991 with a degree in engineering. In 1994, she fulfills her childhood dream of becoming a doctor and graduates from medical school at Northwestern University. 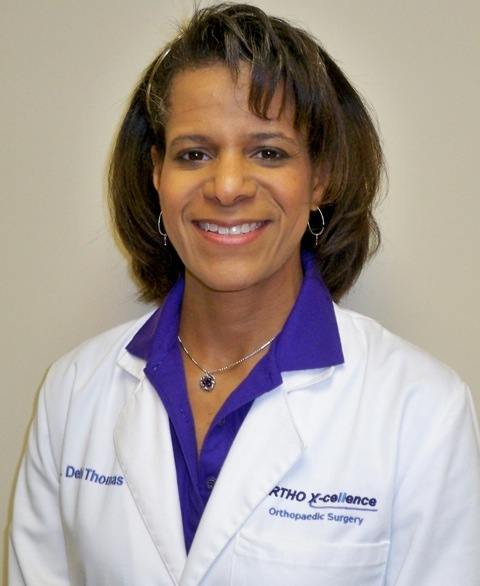 Set to specialize in orthopedic surgery, Dr. Debi Thomas completes her Orthopedic Residency Programs and ultimately goes into private practice. Having mastered, not one, but two of the World’s most difficult courses of study, Dr. Debi Thomas is inducted into the U.S. Figure Skating Hall of Fame in 2000. And her exceptional life continues. Frankly, if Dr. Debi were to rest on her laurels, make tons of money and ‘chill out’ indefinitely, we really can’t blame her for that. Yet, being the ‘champ’ that she truly is, seems Debi Thomas has chosen to answer the Call, once again, and continue the ancient struggle. Having heard little about Debi Thomas since her 1988 Olympic triumph in Calgary, I looked forward to her television appearance. Though rarely do I watch TV’s reality shows, prefer a good romantic comedy or drama instead. That said, I do enjoy the OWN network and truly appreciate Oprah’s vision for it, which is to edify and uplift us all. Sadly, the good will that Oprah has created for OWN just did not extend to Dr. Debi Thomas on its “Iyanla: Fix My Life” show recently. In fact, the show’s host, Iyanla Vanzant, treated Debi badly…very, very badly in my opinion. The obvious question is: What the hell was Iyanla thinking; did she not review the show before it aired? With all of Iyanla’s alleged expertise, seems in review she would have spotted the ego’s treatment plan all up in her mess. Then called Debi immediately, begged her forgiveness, and scrapped the whole thing; or, offer to film it correctly. But she didn’t. Those of us rather familiar with Iyanla’s work over the years have seen her do better. So we know that Iyanla can do better, why she didn’t is a big mystery. Besides airing the woman’s eccentric living conditions and romantic problems in the wrong spirit, seems the most egregious thing that Iyanla did was to call Dr. Thomas’ mental health into question. Not only was this not Iyanla’s call, but her belief in the subjective mental diagnosis she offered up as evidence, which Debi disputed, harkens back to the Dark Ages where eccentric kin were legally deemed insane and given cruel shock treatments that either impaired or finished them, usually for the money. So it’s hard to believe that an alleged New Age “life coach” would actually go there, but this one did. Since the show’s airing on November 7, I’ve read several articles and reader’s comments about Dr. Thomas’ well being, some supportive, some negative as usual. I then visited Debi’s GoFundMe page that seeks financial help and also gives her side of the story. There, among other things, Dr. Debi assures us that: “There are no mental health issues, drugs, or alcohol involved, just healing,” which made me feel a whole lot better about her situation. Thanks Dr. Debi for moving forward in your life, so very, very sorry that Iyanla Vanzant chose condemnation rather than compassion on her show. Sadly, it seems Iyanla could well “fix” her own life before trying to fix someone else’s life. Having been through hard times myself, including years of chronic depression, I have come to realize the healing power of applied spiritual study of the right text (“applied” being the operative word here). Such studies work for me, and will for anyone with an affinity for study and application in particular. A truly humble teacher: Many years ago during a Whole Life Expo in Atlanta where he was one of the featured speakers, at intermission Dr. Dyer stood quietly by his display of books waiting for anyone who might have a question or just wanted to talk. Frankly, I was too awestruck to even say anything, but I shall never forget his wonderful presence. It’s been over twenty years since a lovely lady handed me the Course. She was the bookstore manager at the New Thought church I was attending. Being short on finances she gave me the book, having already been paid for by donated funds, she said. Previously, after meditating for years, one day I cried out to God asking to be happy all the time rather than being blissed out in meditation. Little did I know then that my life would radically change. Not only would I leave my church home of eighteen years, my spiritually evolved teacher-counselor whom I would never see again, and my immediate family, but would move across the country in the process. And so I did. There, I would find the Course, or more like it found me. Upon perusing this great book, I immediately recognized it was for me and hit the ground running, so to speak. The Course also teaches you to teach, the irony is it does not tell you when, exactly. Thus, a lot of its new students, including myself, tend to think formal teaching begins right after you complete the Workbook, which is not usually the case. Though I drafted an extensive outline for organized lectures on the Course that went well and held classes in the local Unity Church, eventually up pops the ego and the classes ended. Clearly, I was so not yet ready to teach the Course. Hurt? Of course I was. Yet, I move on having much to learn, and what a blessing indeed! Today, I am still learning. Yet, I can better see my progress now. And the gift of Inner Peace and Unconditional Happiness is ever near, which is what I was really crying out to God for on that fateful day so long ago. So What Exactly is A Course in Miracles? Wow, pure poetry! The Course’s Introduction brings back such poignant memories of my early days with it. Peace and Light to all. Free the Mind! Hear ye! Hear ye! There is a new paradigm quietly emerging for teaching and practicing the ancient expedient of forgiveness, a sure way to inner peace, happiness and self-empowerment no matter how taxing the outer situation. This occurred to me one day after watching a Life Class led by Oprah and Dr. Phil on the OWN Channel, with emphasis on recognizing the toxic people in our life based on Dr. Phil’s book titled, Life Code: The New Rules For Winning in the Real World. The above subtitle quote is from President John Fitzgerald Kennedy. According to Dr. Phil, the world is rapidly changing, which now urgently requires a new reality. Or, a new way of seeing in order to prevail in our evolving society. He asks, have you ever had an uneasy feeling about someone but gave them the benefit of the doubt? Of course, many in the audience raised their hands (me too). He then illustrates that it is this antiquated, social response that is now an open invitation for disaster in today’s fast-paced world! I thought Wow! And perked up immediately. As I was emotionally exhausted owing to a certain toxic individual in my life. By then, after much soul searching and fact finding, I had discerned that it was not me but the other person that was way out of balance. Thus, I was in dire need of the right support. And this class fit the bill! Thanks Oprah and Dr. Phil. Sadly, we can’t always boot toxic people out of our lives, at least not immediately. So I have learned to quietly ask: What is the lesson I need to learn here Dear God and please let me hurry up and learn it? Of course, it usually does not happen that quickly, yet my learning process has accelerated which is progress nonetheless. Having been on the Spiritual Path several decades now, I’ve also learned to brace myself for my own fault (or faults) that will surly emerge. And so it has, though in a most unlikely form. A while ago, I entered into a business agreement with Richard Parker (a pseudonym) for the upkeep of my car. Borrowed from the acclaimed film titled “Life of Pi,” Richard Parker is also a metaphor but more about that later. Having known Richard Parker for a while and thus having chatted with him on more than one occasion over the years, I thought him to be a rather nice person, one you could trust. Boy was I mistaken. Hence, you never know a person until money enters the picture. And believe me this was strictly business, thus no room for confusion. Initially, we hit it off well. Knowing that I was a devout student-teacher of A Course in Miracles, he started asking me about ACIM and even suggested I started a class with some of his friends, which, as a spiritual teacher, I heard the call for help and took it very seriously. The first class went well; he brought his wife, a close friend and two others also came. Afterwards, only Richard continued coming and we met for a while, but he eventually dropped off. I had the feeling that he was getting too close to reality and did not want to face it. Though he had shared a very traumatic experience in his early life, I sensed that he was in denial of his feelings about it. And since he was not that religiously inclined (probably angry at God) and I am not a licensed therapist, I did not press the matter. Eventually, I discover that Richard Parker was prone to misrepresenting the facts, likely in an effort to cut costs and pad his wallet. One day I had to yell at Richard like a crazy lady to get him to redo something immediately. Obviously shaken, this seemed to throw off his usual game of lies and he began to babble incoherently. Afterwards, I became physically ill. Initially, it appeared to be the flu that lasted several days or a week. Who knows? Then a severe case of food poising hit me (perhaps an overindulgence of potato chips was the culprit…never again, LOL). Having opened my heart to help him spiritually, somehow I felt I was made vulnerable to illness by these negative interactions with Richard, as I rarely become ill. The food poising symptoms were the most traumatic. Feeling really, really bad, I prayed deeply. This truly helped and I soon realized that my body was naturally purging the toxins. Being a lover of Nature, I got that and felt stronger. Then I remember being a young girl sitting on my porch while intently watching a cat eat grass and later regurgitating. Ever curious, I run and ask my mom, who grew up on a farm, and she explained that the animal was sick and the grass was its medicine. Later, I would learn that my grandfather relied on herbs and other natural remedies for their medicines. With this in mind, I naturally embraced holistic healing as I advanced on the Spiritual path. Yet, this belief is not for everyone; thus, I am not advocating natural healing here, just sharing my experiences with intimate friends. Of course, in a pinch, know that God and His angles are still in the miracle business. The next day, after intermittently throwing up pails of bile and releasing diarrhea all night, I actually felt lighter (wonder why) and weighed myself. I had lost over seven pounds, in one day no less! Though I felt better, I was still sick with the diarrhea. So I had to miss Mother’s Day. Finally, after inwardly being urged to eat something starchy, I checked out the internet for the right diet and boiled some pasta which brought things back to normal about 24 hours later. Hallelujah! Knowing this was not yet over between Richard Parker and me, I fall into depression though in denial for a few days. Eventually it hits me that my inner happiness is not there. I thought, wait, as I am usually happy and notice it at least once during the day. And then thought to myself: Hey, what happened to happy? In the school of metaphysics we call that self-inquiry. So, I started regrouping immediately while realizing that I did not come all this way to let a Richard Parker rob me of my Inner Joy. No way, never again! In an effort to return to happy, I turn on Oprah’s Life Class that I had recorded and the healing begins. Afterwards, I download Dr. Phil’s book, Life Code. I was so excited about this book I called my sister and passed it on. Naturally, the above JFK quote, which is in Dr. Phil’s book, caught my eye and I now have a new philosophy, which is very powerful in my opinion. “Forgive your enemies, but never forget their names,” spoken like a true Harvard Law School graduate. I see President Kennedy’s splendid advice as the perfect equation because, though equals, one side cannot effectively work without the other. Yet, together, both sides form the perfect whole. And it is this, the Modern World must learn, which is probably why Dr. Phil chose to highlight JFK’s quote in his book. Thus, the perfect equation has now become the perfect remedy for coping with the “bad people” who might show up in our lives, generally seeking to exploit and steal from us rather than serve others. Scripture teaches us to forgive our enemies, which works as we are also releasing ourselves, being one in The Spirit. Yet, for many of us, men in particular, something always seems missing from this instruction. Now we know why: As, forgiveness, being a quality of the heart, flows from the Feminine aspect of God, while memory, being a quality of the mind, is of the Masculine aspect of God. Yet, for the best possible results in all things, the Feminine and Masculine aspects of God (mind and heart) must work together. And so it is! Though forgiveness is the ultimate expedient for destroying our enemies, not forgetting their names has to be the practical means by which we remember their true nature. Thus, a necessary caution against possible harm, as such persons likely will not change anytime soon. Yet, we need not live in fear, ever. With a made up mind and heart, we are more dangerous than danger. My take on Richard Parker in “Life of Pi” and our story is simple. Besides being a metaphor of discernment between friend and foe, Richard Parker ultimately represents the primal beast we once were. Thus, we all have a little bit of Richard Parker still within us, some more destructive than others. Yet, while Richard Parker often appears to be outside of us, he really is within us; thus, a product of our own mind created by our ego. Another term for Richard Parker is, of course, the ego. As it is our ego that wrongly judges, which ultimately engenders fear, anger, and dark feelings of revenge. As we mature spiritually, Richard Parker begins to diminish and ultimately fades away. But not without a conscious effort to rid our self of our own negative thoughts and feelings. This process is made easier when we realize that the savage within us not only makes us sick, but ultimately robs us of our personal power. Leaving us weak and trembling before an imaginary enemy. Thus the old adage, “Thoughts are things.” Then do we become wise enough to let go of our destructive thoughts and choose peace instead, which automatically empowers us. Hence, “I can see peace instead of this,” (ACIM, Lesson 34). And so it is! And always has been. And always will be. Amen!